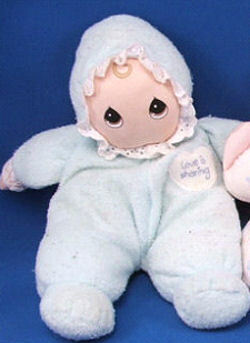 Scott and Ashley are each looking for a 1998 PRECIOUS MOMENTS blond baby doll with LOVE IS SHARING printed in a white heart on a blue terry sleeper. She’s wearing a matching bonnet with white eyelet trim. Here is a blue/teal one but it does not have that patch on the front. Worth a look. The listing says that they will take offers.